I'd like to officially extend an offer to help folks get avatars to use on the forum, or to assist those who already have them to make them even better (within my technical ability). Also, should others want to, they are more than able to help out as well if they should feel so inclined to do so! I won't make a promise on turn-around time since this is all free... but I will try to help out in a reasonable period of time. Just keep in mind, I'm not an artist, but I have been messing with graphic design as a hobby for years (most recently just for scripts). If this sounds interesting, hit me up in the below thread with a request! Edit: Just a general note, if you do use any of these images for yourself, please do re-host them or download them (likely both)... as I can't guarantee they won't move or be deleted at some point from the place I've hosted them. Thanks in advance! Last edited by Thrice Xandvii on 18 Oct 2017 06:31, edited 1 time in total. While I wouldn't mind having an actual avatar of some sort, I've no particularly special things yet to provide for making one. Though this does inspire me to think again about my nations' flags, as I might pick one of them to align myself against. Hm...how long does this offer last, or is it generally in effect (provided you have time), and you just happened to create a thread on it? Axiem wrote: ...generally in effect (provided you have time), and you just happened to create a thread on it? Obviously that one is too big. 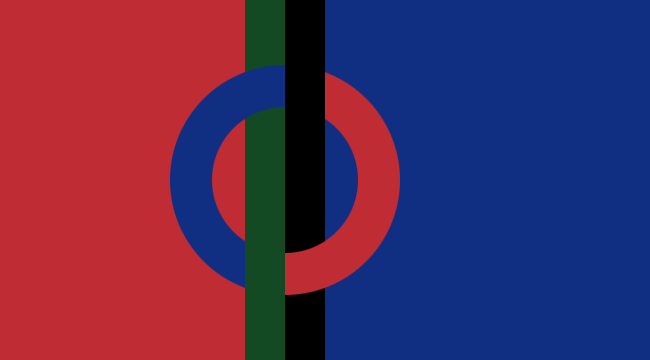 Can you do something aesthetically like the Sámi flag, only replacing the yellow with black (I'm think these'll be the Frislandian colour-scheme)? Oooohhh this sounds interesting. It would be pretty cool if I could have mine redone so it's cleaner and maybe put in some shadows (if the weird isometrics compute in your head). Could you also swap out the blue for #0277BD, the white for #FAFAFA, and the orange for #EF6C00? 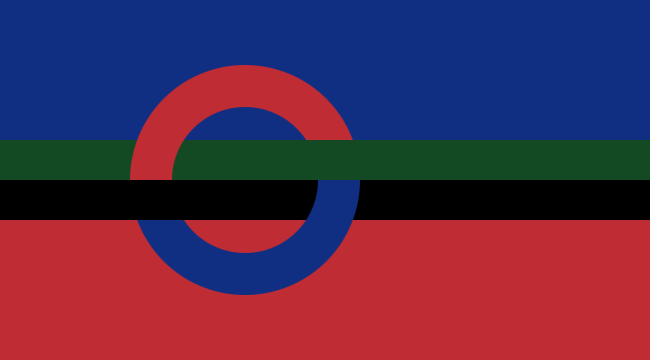 Frislander wrote: Can you do something aesthetically like the Sámi flag, only replacing the yellow with black (I'm think these'll be the Frislandian colour-scheme)? 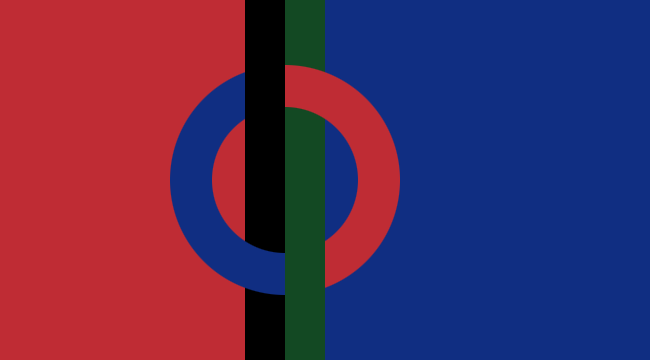 I started with the basic design, made it somewhat longer, adjusted the ring to be the same width as the stripes, and did a little overlap thing with them... As for the colors, feel free to give me some direction on that as well since I just used shades of the colors that I already had in my flag file. From here, we can move to what aspect you'd like as the avatar. I am presuming a centered or somewhat off-center section focusing in the area of the ring? OTʜᴇB wrote: Oooohhh this sounds interesting. It would be pretty cool if I could have mine redone so it's cleaner and maybe put in some shadows (if the weird isometrics compute in your head). Could you also swap out the blue for #0277BD, the white for #FAFAFA, and the orange for #EF6C00? I just did the color swap on this one as I wasn't sure precisely how best to go about re-drawing that to "clean it up." I could attempt to work on it, but I would want to make an orthagonal grid somehow to guide me... and I'm not certain how to do that so that it snaps in PS. I could wing it, but again, I wasn't sure how much you would want to remain exactly the same, and how much was open to interpretation. Hmm, looks good, but before we do that could you try a version swapping the green and the black around? And maybe another one with the design rotated 90 degrees anti-clockwise? When you say the "design" do you mean with the stripes going lengthwise on the flag, or the entire flag design rotated so that the blue is on top? And I may have made a few for some folks... despite not actually being asked yet. I remember that little troll/demon thing being Xonen's but who does the crab belong to? No one yet, just some thoughts for Clawgrip. Thrice Xandvii wrote: When you say the "design" do you mean with the stripes going lengthwise on the flag, or the entire flag design rotated so that the blue is on top? Definitely the latter: I do like that, though perhaps to make it perfect the thing to do would be to make the crescent shapes symmetrical so that the green and black stripes are unbroken. And would it be possible to brighten up the colours a bit? Do you mean bring the semi-circles to the front with the stripes behind them or have the stripes over them? As for the colors, would you mind maybe suggesting some specific colors via hex or RGB values? There are tons of websites that could help you do that. Thrice Xandvii wrote: Do you mean bring the semi-circles to the front with the stripes behind them or have the stripes over them? As for the colors, would you mind maybe suggesting some specific colors via hex or RGB values? There are tons of websites that could help you do that. 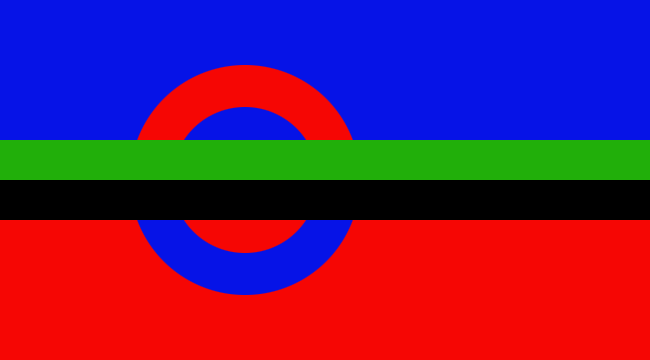 Have the stripes over the semicircles, so the red semi-circle could represent a rising sun and the blue one a river. Those.... are a bit eye-searing in intensity, IMO, but they are posted below with a brighter but more muted alternative. Thrice Xandvii wrote: Those.... are a bit eye-searing in intensity, IMO, but they are posted below with a brighter but more muted alternative. Is there a midpoint between them, because I think would be optimal? I'll see what I can do when I get home. I also did a version of the flag with the newest brighter but still muted tones, but with the newest shade of green that looks really good, IMO. 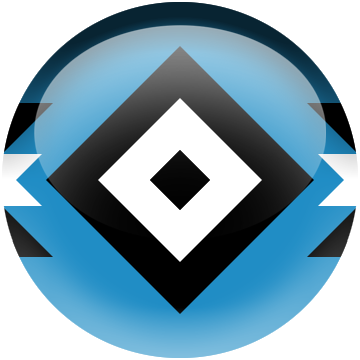 So for the avatar I'm thinking focussing on the circle design, but still keep it slightly off-centre. The one posted is full-size, so feel free to do what you will with it. I'll crop something up when I get home or sometime later tomorrow.